Midship Marine was established in 1989 and has been constructing custom aluminum vessels and satisfying a wide range of customers ever since. The company’s founder and president, Michael Hinojosa, has been designing aluminum vessels for over thirty-three years. 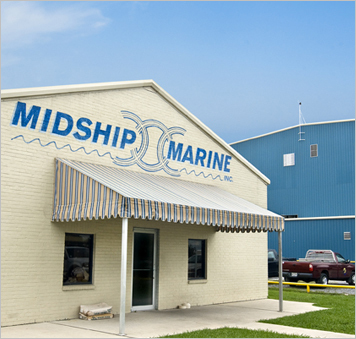 Midship Marine is a family business and is built upon quality and pride of workmanship. Midship Marine builds a wide range of aluminum water craft including: Mono-hull and Catamaran passenger ferries, Sailing Catamarans, Semi-submersibles, Headboats, Oil Skimmers and Crew/Supply boats. These vessels range in size from 25 to 225 feet in length and can be constructed from our own custom designs or built according to customer supplied plans.